Welcome to another week of American Girl History Units. This week, Susan Mathis is sharing about the life and times of Swedish born, Kirsten, a doll that is much loved around these parts. My little Sweetie Pea saved up for months in order to purchase her very own blonde-haired pioneer. Although, she doesn't play with it as much these days, Kirsten still holds a special spot right next to her at bedtime. 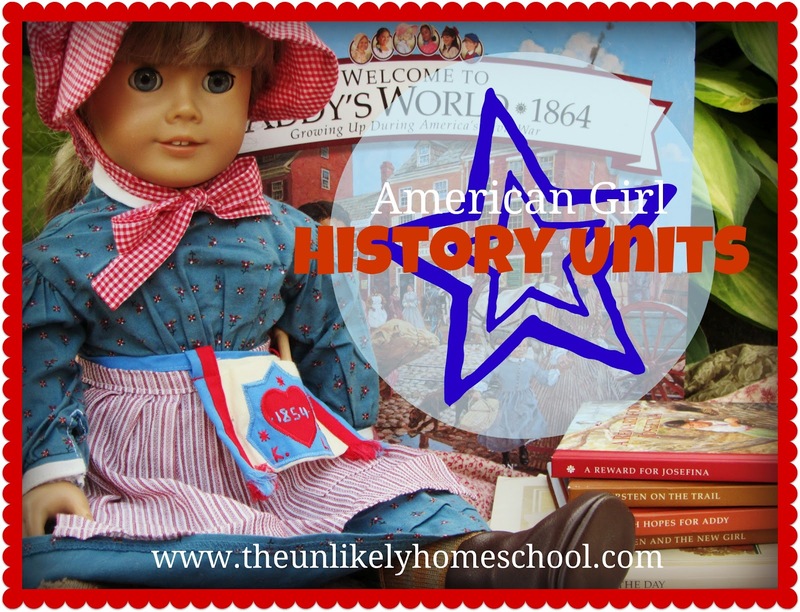 If you are just joining us, be sure to head over and check out a few "before you begin" ideas that Susan has shared about implementing American Girls into your homeschool history studies. Kirsten's story gives us insight into the first major wave of immigrants to come to the country during the middle of the 19th century. It makes an interesting contrast to the story of Rebecca's family that comes later. Locate Sweden on the globe. Then locate Minnesota. Help your daughter appreciate how far they are from each other by comparing it to a trip you’ve been on as a family. However, remind her that Kirsten’s family did not travel by plane but by boats and wagons. Find 1854 on the Timeline, as well as 1844, the year Kirsten was born. Review what you learned earlier about what was going on in the country at that time. Emphasize the significance of immigration to the United States. Choose a craft to work on while you’re studying Kirsten. An obvious choice would be to make a small patchwork pillow. When Kirsten arrived in America, she could not speak English. As a family, watch a movie or TV show in a foreign language (without subtitles) and see how much you can figure out about what’s going on just by watching and listening for inflection. Depending on when you started your study, and how fast you have progressed, the holidays are now approaching. Consider incorporating some of Kirsten’s Swedish tradtions into your family celebrations.